When it comes to peak emotional and physical fitness, health-care communications and stress management, no one is better versed than Dr. James Weber. 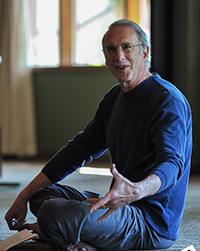 A distinguished surgeon for nearly three decades, Dr. Weber closed his practice in 2008, and is now a yoga instructor, a yoga therapist, and an Ayurvedic counselor. He served for years as an Associate Clinical Professor of Surgery at the University of Washington. Dr. Weber graduated from Yale University with a degree in English literature and received his medical degree from Columbia University. His surgery training was done at the University of Washington. He is board certified in general surgery, a fellow of the American College of Surgeons, and a member of the American Society for Metabolic and Bariatric Surgery. His yoga teacher training was through YogaWorks, and his Ayurvedic training was via Kerala Ayurveda. He has been teaching high school, college and graduate students as well as resident doctors for his entire career. He has been honored for his teaching skills on three occasions. He is an author, a poet, a gardener, and an avid fan of baseball, opera, classical music, and Theodore Roosevelt. Dr. Weber‘s website, www.prescriptionyoga.com, a work in progress and contains a great deal of useful information. Be sure to have a look.